RARE Fortune Ninette in "Garden Outfit"
Catalog > RARE Fortune Ninette in "Garden Outfit"
Beautiful and Rare, vintage 1950s Fortunes' Ninette is a type #2 SLW with blue sleep eyes (need nudging), and soft, tosca side-part flip. Her walker works and her arms hold a pose. 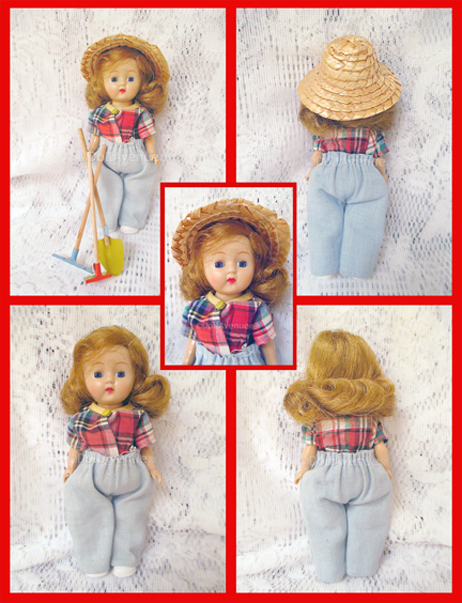 Ninette is wearing "Garden Outfit" #13/2 consisting of a red plaid linen shirt with yellow trimmed collar and small brass snap at neckline; light blue jeans; straw hat. Included are a wonderful set of vintage Ginny garden tools. Shovel and rake are blue on one side and yellow on the other; Red and yellow garden hoe. Ninette dolls are truly hard to find and most often not in such pristine, near-mint condition. She is a fine collectible example of this style doll and would make an wonderful addition to any vintage doll collection. Doll Facts: 8" Ninette is a hard plastic walking doll that was made from a Ginger mold. This Type #2 is the same unmarked mold as the Cosmopolitan Ginger Type #2 with molded lashes lashes, mold marks through the ear, C-shaped Ginger arm hooks, toe and finger details, as well as quality costumes. Fortune used Ginger molds for all of their Ninette dolls and some of their Pam dolls.